Cleo has been reviewed by thousands of our customers, but it is comforting to know their opinions do not stand alone! 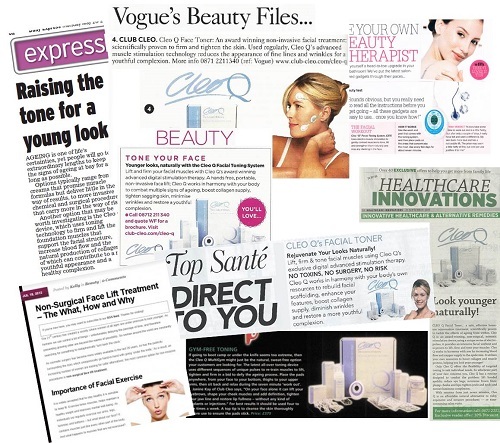 Many magazines have tried and tested the Cleo Q, and we are proud of the professional responses we receive! "Amazing results: crows feet & laughter lines have disappeared, cheekbones given more definition, fuller lips & firmer neck & jaw." If you are seeking a more detailed analysis of what the big mags have to say about us, we have kept all the articles for you to read! Explore in depth the responses we have received over our 25 years of non-invasive beauty treatment, and see how others think we compare to our competitors! Just click the title to read more! Cleo has had a lot of celebrity interest over the years, many of whom we're not at liberty to disclose due to data protection, but here's a few who are happy to share their secret to looking young! You're in good looking company when you use Cleo Q as your anti-ageing treatment.